Slight progress on the 9th Age preparation front: While Warhammer 8th edition used dice to determine the amount of magic dice, 9th Age uses cards to generate dice and so-called "Veil tokens" that can be converted into additional magic dice, used for spell effects or stored to some extend. 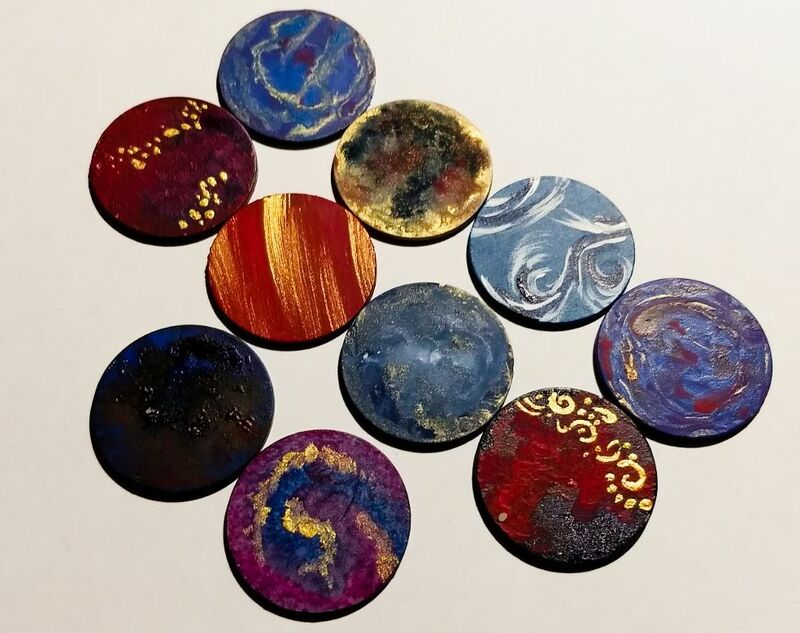 Spellcasters and magical items can generate these tokens to. While I could use some boring tokens, coins or dice to track them, I decided that this was the perfect space for some swirly magical effect, painting some bases with whatever comes to our minds. Handling them in game will be easy and a fancy affair! (The backsides still need some painting, and there will be a few more.) Another session and they should be done.